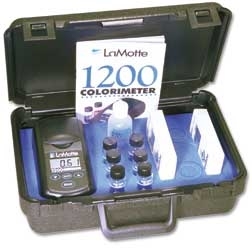 The Chlorine Colorimeter Kit measures the concentration of free available chlorine and total residual chlorine in water samples. Colorimetry is simply a measure of color. In a chemical colorimetric test, the intensity of color from a reaction must be proportional to the concentration of the colored light absorbed by a colored sample in reference to a colorless sample or blank. The colorimeter photoelectronically measures the amount of colored light absorbed by a colored sample in reference to a blank. The colorimeter has been calibrated to read test results directly in part per million (ppm). The chlorine colorimeter tests for free available and total residual chlorine uses DPD tablets #1 and #3, respectively. Total combined chlorine is calculated from the difference of these two measurements. DPD stands for N,N Diethyl-1,4 Phenylenediamine Sulfate. The addition of a DPD tablet to water samples containing chlorine results in the formation of a reddish tint to the water. The intensity of the red color is proportional to the concentration of the chlorine in the water. Using a colorimeter removes the subjectivity of different people measuring the intensity of color and different light conditions. Requirements: The colorimeter can be used in the classroom or out in the field. Take a water sample. Fill the plastic water sample collecting bottle (0688) with sample water. This will be used to dispense sample water for the tests. Rinse and fill a colorimeter tube (0290) to the 10 ml line with sample water. Cap and wipe dry. Insert this sample into the colorimeter to take a "blank" or "zero" reading. The arrow on the meter should line up with the index line on the tube. Close the lid to the colorimeter and push the READ button to turn the meter on. Press the ZERO button and hold it for 2 seconds until "BLA" is displayed. Release the button to take a zero reading. Empty all but a few drops of the sample water from the tube. Using the same tube, add one DPD #1 tablet and crush with tablet crusher. Fill the tube back up to the 10 ml line with sample water. Cap and wipe dry. Insert the tube into the meter, align the vertical index line on the tube with the arrow on the meter, and push the READ button. Record results as ppm free available chlorine. Save sample for total chlorine test. Add one DPD #3 tablet to the sample (the same tube with sample water and a dissolved DPD #1 tablet). Crush the tablet. Cap, wipe dry. Insert the tube into the meter, aligning the vertical index line with the arrow on the meter and push the READ button. Record results as ppm total residual chlorine. Calculate combined chlorine. Subtract the free available chlorine from total residual chlorine reading to determine the ppm combined chlorine present in the water sample.